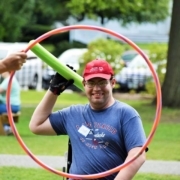 Preparation for the Brave Challenge, which is an obstacle race designed for people with cognitive, developmental, physical, and emotional disabilities. Obstacles will be modified to challenge the needs of all individuals. BRAVE Challenge will give people the opportunity to step out of their comfort zone and compete against others in a one-of-a-kind setting. Please contact jayne@snsc-uv.org for more information.